After a deluge of teasing press releases and premature speculation, we can finally share some Very Important NASA News: Today, the agency announced that a team of scientists has confirmed seven Earth-sized exoplanets orbiting TRAPPIST-1, a star located just 39 light-years away from our Sun. The six inner planets are very likely to be rocky, are roughly the same mass as Earth, and are thought to have comparable surface temperatures to our own planet. Three of the planets may even be able to support liquid water and perhaps, life. This discovery signifies the largest number of Earth-sized planets found and largest number of potentially habitable worlds for a single star system. Both factors will make TRAPPIST-1 immensely appealing in the ongoing search for habitable worlds and life beyond Earth. In 2016, Gillon, along with astronomers Amaury Triaud, Emmanuël Jehin and others spotted three exoplanets orbiting TRAPPIST-1, classified as an “ultracool dwarf” star because it features surface temperatures under 4,400 degrees Fahrenheit. After following up on TRAPPIST-1 using the instruments like NASA’s Spitzer Telescope and the ESO’s Very Large Telescope, the team found four more exoplanets in the star system. All of the potentially Earth-like worlds were spotted using the transit method, which measures dips in a star’s light output as a planetary body crosses in front from our line of sight. The news has justifiably sent space geeks into a frenzy. 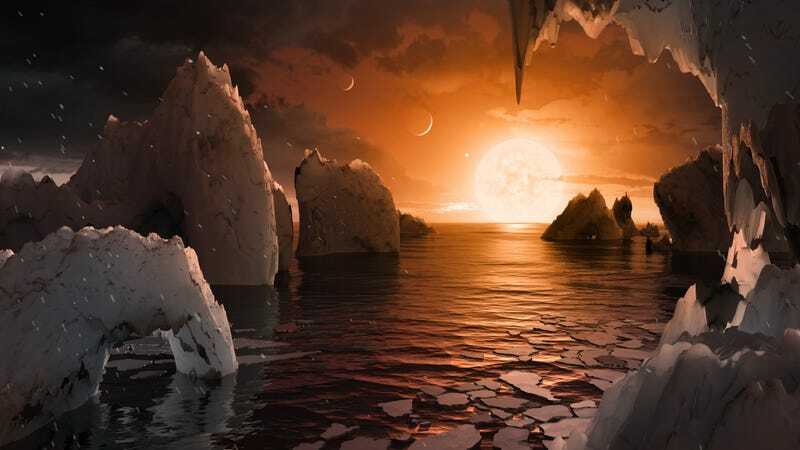 “Finding several potential habitable planets per star is great news for our search for life,” Lisa Kaltenegger, Director of the Carl Sagan Institute at Cornell University, told Gizmodo. In our solar system, Earth is situated squarely in the habitable zone where liquid water can form, while two other planets—Venus and Mars—skirt the inner and outer edge, respectively. According to models, the TRAPPIST-1 system contains three planets in the habitable zone, making it the record holder for stars we know of with rocky planets that could potentially support liquid water, Kaltenegger explained. At this point, we have more questions than answers about these exoplanets. Hopefully, the James Webb Telescope, which launches next year, and the yet-to-be-completed Extremely Large Telescope will be able to tell us more about their atmospheres. This will be critical for determining whether or not the planets really can support liquid water and life. One of the many questions from this discovery is, well, can we go there? While star system Proxima Centauri is a more sensible choice for an interstellar voyage, since it also contains a rocky, habitable-zone planet and is much closer to Earth (4.22 light years away), the opportunity to find life on multiple worlds in the TRAPPIST-1 system increases its chances of a visit someday. “Finding many potential habitable planets around a star is definitely motivating,” Kaltenegger said.